This post is brought to you by T.J.Maxx . The opinion on the sponsored post is mine. As the temperatures heightens and summer draws closer, it is time to start thinking and shopping for the perfect summer wardrobe. If you are looking for trendy pieces, stylish clothes at great prices, T.J.Maxx is the place to shop. Whites are a classic piece to add to your summer wardrobe. 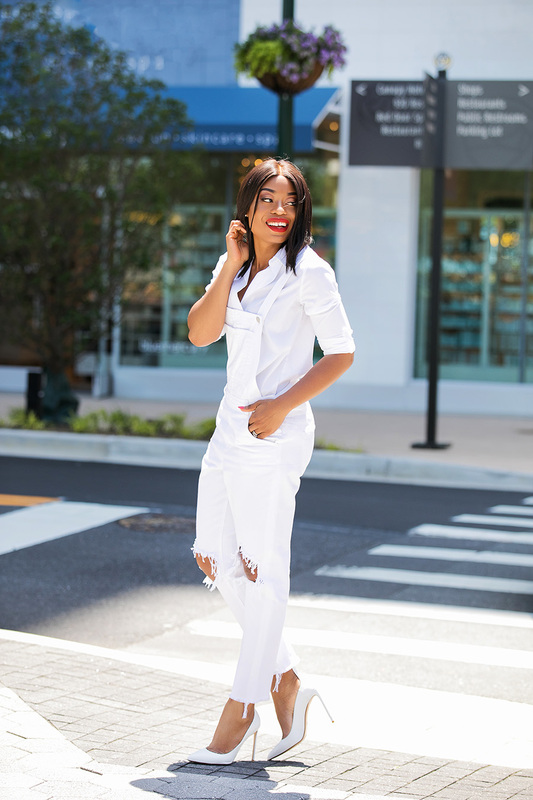 Summer whites are a must-have and T.J.Maxx has an entire section on their site dedicated to white apparel and accessories which make browsing and shopping easy! 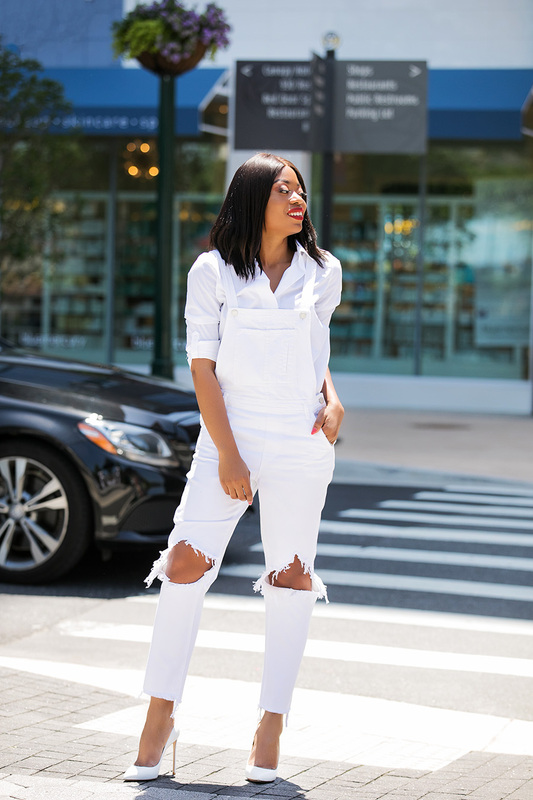 Lately, I have been obsessing over white looks, hence why I was drawn to these white denim overalls. Overalls are great pieces to wear now and all seasons. There are so many ways to style overalls. 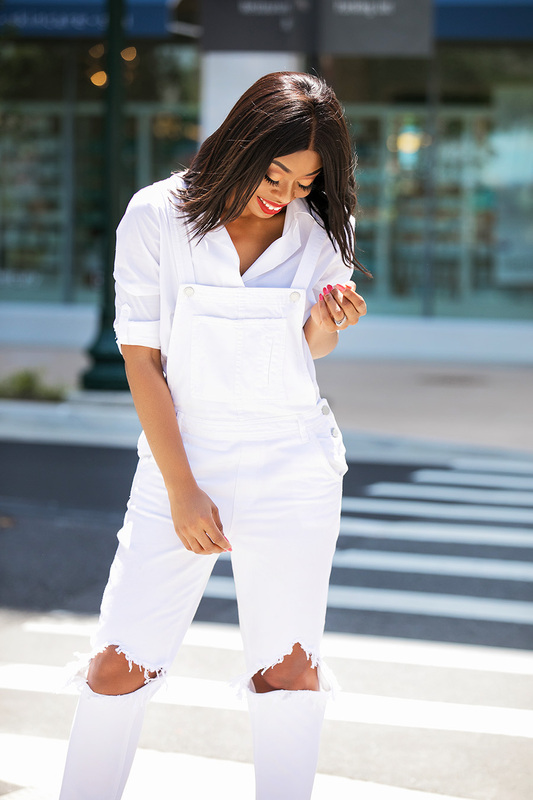 This white denim overall caught my attention because of the ripped and distressed knees and the strap style, which is fun and unique. 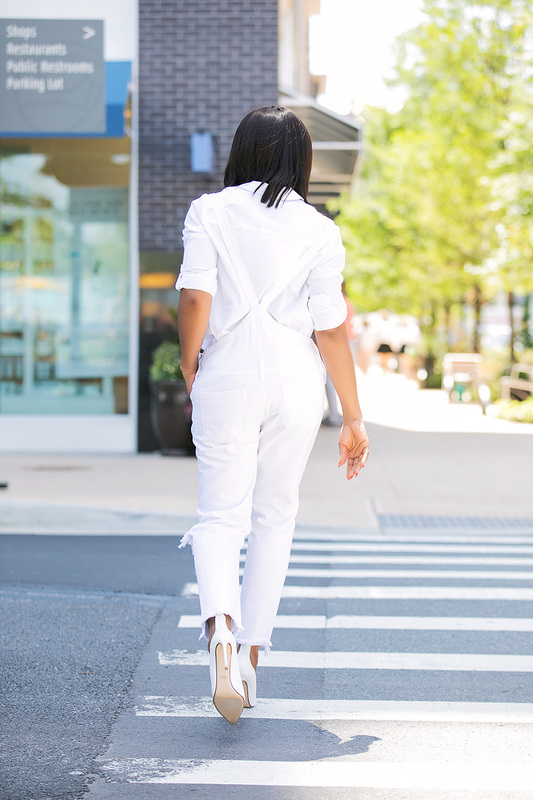 I styled this white overall with a crisp white shirt for a chic and elegant feel completed with sneakers for a relaxed summer look. On a different occasion such a brunch, fashion event or a date, I will substitute the sneakers for heels.You guys know I love color, so you can all mix it up with a color tee for a more relaxed look. So many options, I look forward to wearing these again and again. Did you know you can shop T.J.Maxx online? Like T.J.Maxx stores, tjmaxx.com has hundreds of new arrivals each week. Moreover, it is free and easy to return in stores – you don’t have to worry if something doesn’t fit. Tjmaxx.com offers on-trend summer fashion and accessories: shoes, watches, jewelry, handbags and so much more at amazing prices. Not only do they offers pieces for women, you can find great summer looks for men and kids, too. Some of the summer must-have items that you will find online at tjmaxx.com include ruffle tops, floral prints, fun dresses (casual, maxi dresses and cocktail), shorts, skirts, bright colored pieces and much more.